Does anyone know of any projects to create municipal broadband in Eastern Massachusetts? Considering the possibility of the death of net-neutrality, I was just wondering if there are any efforts in that direction. I wrote up my experience with the HeatSmart/CoolSmart city program for these heat pump systems. It has been extended to Feb 15, so if your heating system is creaking at this point, might be worth a look. At the Climate Commission meeting last night, we got an update on the heat pumps program that's running now. If you have been thinking about ways to reduce your carbon footprint, you really ought to take a look at these new and high-tech super efficient devices. Or if you know your heating equipment is getting up there in age, you should at least come and learn about these. And they can do heating as well as cooling. In my house, it looks like I'll be able to reduce my natural gas heating a lot and rely on my solar for much of my heating and cooling. I've been resisting air conditioning over the years for a variety of reasons, but this new style of heating and cooling tech I can have both, with much less environmental impact (and noise). Also right now there are big rebates and low interest loans. It's hard to know how much longer good programs like this will run in our current political environment, you know? New city energy efficiency program: HeatSmart/CoolSmart. Aug 22 event. It's like the Solarize campaign I ran as "coach" last year--but this time it's not as expensive a fix, and it doesn't matter what orientation or condition your roof is in. There are big rebates and loans as part of this. So don't be daunted by the costs at first--have someone come and evaluate your situation and see if it's right for you. 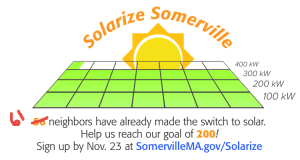 Our successful Solarize Somerville program has one more thing to wrap up. Because we hit our goal, we are going to be able to get a solar array donated to an eligible non-profit in the 'Ville. And please share this around your networks so that we can be sure as many people as possible hear about this. For eligibility requirements and to nominate a local nonprofit or house of worship, visit www.somervillema.gov/5kw. The online application will be available until Friday, June 30, 2017. Hi again folks: although our Solarize Somerville program technically closed after successfully connecting over 100 neighbors with solar for their homes (installations are still going to happen for a while), some people couldn't go solar for various reasons. Roof issues, orientation, condo legal issues, or being in rental property meant not everyone had a suitable place for panels. But I just got a newsletter from the city about a community solar option that I wanted to pass along, since people had asked me during the program. Clip from the city below. Renters and owners who want to go solar but could not participate in Solarize Somerville might find an opportunity in Community Solar. Boston-based Relay Power invites Somerville residents to sign up for a spot in their new, local community solar garden. Participants pay nothing up front and save 10% on their electricity. After subscribing, the solar credits will be automatically transferred to offset your bill. No further effort is required. The new site in Dover, MA will hold about 100 participants and is expected to be full by 2/28/17. The site is not constructed yet and will likely go live around May. Please visit relaypower.com for more information. Note: The City is not officially partnered with Mass Energy Consumers Alliance or Relay Power, but we wanted to share the opportunities with residents. The City is not responsible for any actions taken by these institutions or individuals. Quick update on the Solarize Somerville program, with a deadline notice. But there are 2 other things for folks that don't require you to own a sunny roof. We are up to 45 neighbors and 239 kW of solar power! Our goal of a donated array is in sight! I haven't seen a post on this recently and I originally had Comcast (now xfinity), prices went thru the roof and switched to RCN a couple of years ago. My internet connection is not as reliable (both speed and dropped connection) as I like so I am considering an offer from xFinity. I know I need to ask specific and detailed questions to figure the true price. Any thoughts on digital tv, higher speed internet and reliability for either provider. If I am going to do this, I want to do it before the September rush! The objective of municipal aggregation is to lower electricity bills through the formation of a buying group composed of the residents and businesses without interfering with the level of service provided by the existing utility (Eversource in Somerville), which will continue to distribute the electricity supply. In addition to lowering and stabilizing electricity prices, aggregation can be used to increase the amount of renewable energy in the community’s energy supply. It sounded like a reasonable proposal, which has been adopted in other communities, as a way to help access more green power, among other benefits. We are still having other initiatives like Solarize Somerville (which is still underway and will roll out later in the spring), but that won't be suitable for everyone's situation. So this might be an option some folks would like to investigate. I'm posting to let people know the shady utility marketers are back, if they ever left. Last night I had an unsolicited visit to my front door by a guy who represented himself (vaguely) as from Eversource, here to roll back my rate increase if I would just show him an electric bill. I have little doubt he was a shady marketer for an alternative electricity supplier. If he wasn't that, I don't know what he was, because he certainly wasn't from Eversource. My phone rang just then so I used that as an excuse - I told him this call was important and I couldn't talk & closed the door in his face. So I never got who he actually represented. I recognized the modus operandi thanks to my memory of a thread here just exactly a year ago ("Phone call from "PalmCo" wanting to change my electricity supplier"). Since that was useful to me, I thought I'd return the favor by warning those here who may be new here or have forgotten. I trust that no one here would show a bill, but it's much easier to react appropriately if you immediately recognize what's going on. Last night around 7 pm, someone falsely claiming to be from RCN tried to get into my across-the-hall neighbor's apartment. He said something about a problem in her apartment that was affecting service to the rest of the building. She did NOT let him in, and instead called both RCN and the building manager. RCN confirmed that they don't make visits like this after 5 pm. 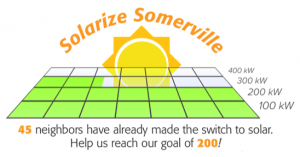 Solarize Somerville is a go! 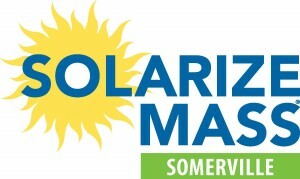 You can learn more about the MassCEC and the SolarizeMass program at: www.solarizemass.com . 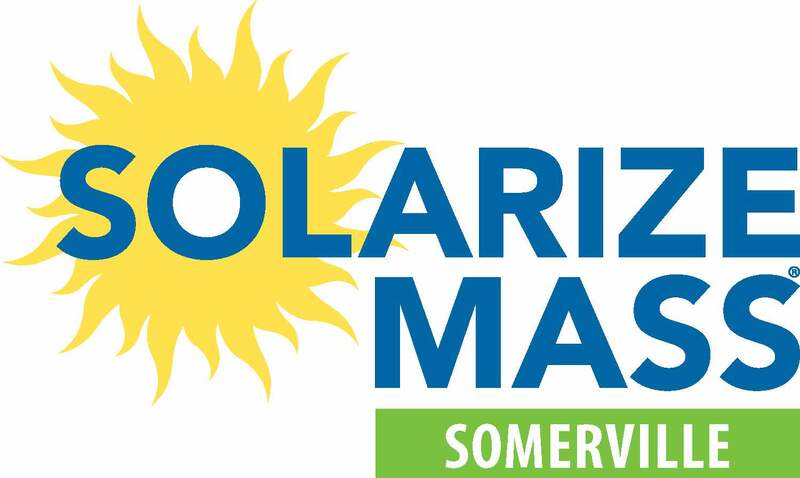 Somerville is in Solarize Mass for 2016! From the email: "As the announcement has just been made, we don't have a lot of additional information at this time. But this selection means that we can now work with the city and the state to help residents of Somerville to decide if solar is a suitable option for them and their homes or businesses. We'll be developing and sharing educational materials, we'll have events to help people learn more and get questions answered, and we will help people to understand the processes associated with generating local, artisanal electrons." mem_winterhill - New city energy efficiency program: HeatSmart/CoolSmart. Aug 22 event. mem-winterhill.livejournal.com - Solarize Somerville is a go! mzrowan.livejournal.com - Somerville is in Solarize Mass for 2016!